Jim Sharples is a very skilled furniture designer and maker based in Bristol. 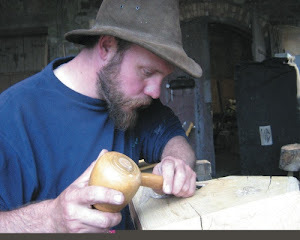 He needed some carvings on his latest project and asked me if I could help. I really enjoyed the next part of the commission. Jim wanted a carving on part of the woodwork that was fun and relevant to the use of the space in food preparation. I decided to carve some vegetable characters jumping into the pot to make dinner. After sending a sketch to Jim for approval, they were carved in shallow relief. This meant that there weren't any deep pockets in the carving that would be hard to clean properly. The veg and pasta are running or crawling along the top of the box, then jumping into the pot below. Look out for the sunbathing broccoli, the parachuting pea and the tomato trying to 'ketchup'! Jim has promised to send photos of the finished project and I'm really looking forward to seeing it all in place. Running workshops for LinkAge is always a lot of fun. They organise projects to try and get young and old people working together, encouraging communication between two groups that might not otherwise come into contact in a positive situation. I've led several workshops in the west of Bristol for LinkAge previously and it was great to be asked to run these two days at Blaise Weston Court retirement home in Lawrence Weston. Everything was set up in the main atrium of the building, so residents could drop in and have a go if they wanted to. There were two possible activities; making a simple, shallow relief carving or working together to make a bench from larch timber, to go in the garden of the home. I hadn't run a session in this kind of environment before and noticed that many people having a go had mobility issues, which would perhaps make going to a venue elsewhere difficult and unappealing. It was great to see them getting stuck into the activity in a more convenient setting and some people commented that they really enjoyed using tools again, after a working life in a trade such as electrician. Three young people from the local Gateway school were also helping to build the bench and they worked very hard, alongside one of the residents of the home, making a great job of the finished bench. Everyone seemed very happy with how things went and I hope that the bench will be in the garden for a long time to come! This one was a first for me: creating an oak sign with the wording in Greek (not a language that I'm familiar with). It will be hung on a house in Greece and so I waited for the recipients to okay the lettering before starting work. In case you are wondering, the sign says 'House of Flowers'. The edges of the sign were deliberately left with tool marks to seem more rustic and the white lettering will stand out even if the oak starts to age and 'silver' on exposure to the weather. I really enjoyed painting the hibiscus flower. It's nice to lay down the carving tools and pick up a paintbrush now and again.